Macintosh, commonly nicknamed Mac is a brand name which covers several lines of personal computers designed, developed, and marketed by Apple Inc. The Macintosh 128K was released on January 24, 1984; it was the first commercially successful personal computer to feature a mouse and a graphical user interface (GUI) rather than a command line interface. Through the second half of the 1980s, the company built market share only to see it dissipate in the 1990s as the personal computer market shifted towards IBM PC Compatible machines running MS-DOS and Microsoft Windows. Apple consolidated multiple consumer-level desktop models into the 1998 iMac all-in-one, which sold extremely well and saw the Macintosh brand revitalized. Current Mac systems are mainly targeted at the home, education, and creative professional markets. They are: the aforementioned (though upgraded) iMac and the entry-level Mac mini desktop models, the workstation-level Mac Pro tower, the MacBook, MacBook Air and MacBook Pro laptops, and the Xserve server. The Macintosh project started in the late 1970s with Jef Raskin, an Apple employee, who envisioned an easy-to-use, low-cost computer for the average consumer. In September 1979, Raskin was authorized to start hiring for the project, and he began to look for an engineer who could put together a prototype. Bill Atkinson, a member of Apple’s Lisa team (which was developing a similar but higher-end computer), introduced him to Burrell Smith, a service technician who had been hired earlier that year. Over the years, Raskin assembled a large development team that designed and built the original Macintosh hardware and software; besides Raskin, Atkinson and Smith, the team included Chris Espinosa, Joanna Hoffman, George Crow, Jerry Manock, Susan Kare, Andy Hertzfeld, and Daniel Kottke. Smith’s first Macintosh board was built to Raskin’s design specifications: it had 64 kilobytes (KB) of RAM, used the Motorola 6809E microprocessor, and was capable of supporting a 256×256 pixel black-and-white bitmap display. Bud Tribble, a Macintosh programmer, was interested in running the Lisa’s graphical programs on the Macintosh, and asked Smith whether he could incorporate the Lisa’s Motorola 68000 microprocessor into the Mac while still keeping the production cost down. By December 1980, Smith had succeeded in designing a board that not only used the 68000, but bumped its speed from 5 to 8 megahertz (MHz); this board also had the capacity to support a 384×256 pixel display. Smith’s design used fewer RAM chips than the Lisa, which made production of the board significantly more cost-efficient. The final Mac design was self-contained and had the complete QuickDraw picture language and interpreter in 64 Kb of ROM – far than most other computers; it had 128 KB of RAM, in the form of sixteen 64 kilobit (Kb) RAM chips soldered to the logicboard. Though there were no memory slots, its RAM was expandable to 512 KB by means of soldering sixteen chip sockets to accept 256 Kb RAM chips in place of the factory-installed chips. The final product’s screen was a 9-inch, 512×342 pixel monochrome display, exceeding the prototypes. The original 1984 Mac OS desktop featured a radically new graphical user interface. Users communicated with the computer not through abstract lines of code but rather using a metaphorical desktop that included items that the user was already familiar with. The design caught the attention of Steve Jobs, co-founder of Apple. Realizing that the Macintosh was more marketable than the Lisa, he began to focus his attention on the project. Raskin finally left the Macintosh project in 1981 over a personality conflict with Jobs, and the final Macintosh design is said to be closer to Jobs’ ideas than Raskin’s. After hearing of the pioneering GUI technology being developed at Xerox PARC, Jobs had negotiated a visit to see the Xerox Alto computer and Smalltalk development tools in exchange for Apple stock options. 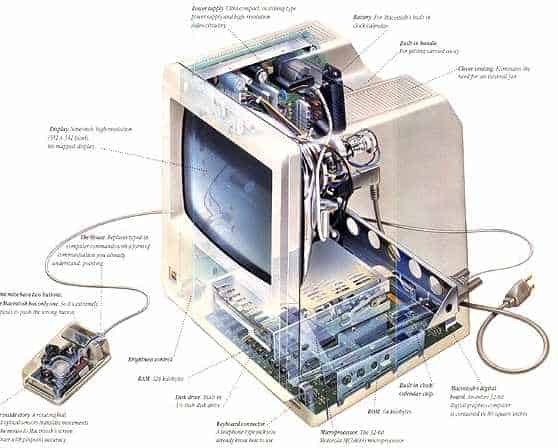 The Lisa and Macintosh user interfaces were partially influenced by technology seen at Xerox PARC and were combined with the Macintosh group’s own ideas. Jobs also commissioned industrial designer Hartmut Esslinger to work on the Macintosh line, resulting in the “Snow White” design language; although it came too late for the earliest Macs, it was implemented in most other mid- to late-1980s Apple computers. However, Jobs’ leadership at the Macintosh project was short-lived; after an internal power struggle with new CEO John Sculley, Jobs angrily resigned from Apple in 1985, went on to found NeXT, another computer company, and did not return until 1997. This television commercial, which aired during the Super Bowl, launched the original Macintosh. For a special post-election edition of Newsweek in November 1984, Apple spent more than US$2.5 million to buy all 39 of the advertising pages in the issue. Apple also ran a “Test Drive a Macintosh” promotion, in which potential buyers with a credit card could take home a Macintosh for 24 hours and return it to a dealer afterwards. While 200,000 people participated, dealers disliked the promotion, the supply of computers was insufficient for demand, and many were returned in such a bad shape that they could no longer be sold. This marketing campaign caused CEO John Sculley to raise the price from US$1,995 to US$2,495 (adjusting for inflation, about $5,000 in 2007). Two days after the 1984 ad aired, the Macintosh went on sale. It came bundled with two applications designed to show off its interface: MacWrite and MacPaint. Although the Mac garnered an immediate, enthusiastic following, it was too radical for some, who labeled it a mere “toy.” Because the machine was entirely designed around the GUI, existing text-mode and command-driven applications had to be redesigned and the programming code rewritten; this was a challenging undertaking that many software developers shied away from, and resulted in an initial lack of software for the new system. In April 1984 Microsoft’s MultiPlan migrated over from MS-DOS, followed by Microsoft Word in January 1985. In 1985, Lotus Software introduced Lotus Jazz after the success of Lotus 1-2-3 for the IBM PC, although it was largely a flop. Apple introduced Macintosh Office the same year with the lemmings ad. Infamous for insulting its own potential customers, it was not successful. I’m doing an assessment about Apple in the 1980’s… I have to discribe Apple competitive advatages in this periode. Because you seem to know a lot about the company history, having you opinion could be very usefull. In your point of view :could I say that its vertical integration is one of them (others: technology, design) ? I’ll understand if you won’t answer, and thank you anyway for this article which already help me a lot. Question: What makes Apple revolutionary? Guy Kawasaki: if you were to ask people in 1983, you know, what would you like in a personal computer? They would have said, bigger, faster, cheaper, MS-DOS machine, bigger, faster, cheaper Apple II. No one would have described the Macintosh. And so the genius of Steve Jobs is not that he listens to the marketplace focus groups and marketing research and then he takes that research and he implements it, he does not believe in market research. Market research for Apple Computer is Steve’s left hemisphere is connected to his right hemisphere. That’s the focus group. And so the lesson of Apple is, you know, you cannot necessarily just listen to what able are saying they need because they are going to define everything they need in terms they already know, bigger, faster, cheaper. The shrill revolutionary, then surely enchanting company creates a product or service before people can really define the need for that product or service. They anticipated where the market will go as opposed to simply reacting quickly to where the market is already going.